When I was an intern at Elmbrook Church when Stuart Briscoe was the senior pastor, we read Charles Spurgeon's LECTURES TO MY STUDENTS. As we studied and discussed the book as a staff, there was one point that has stuck with me ever since. 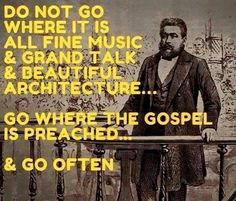 Spurgeon wrote "If you think you can be/do something other than be a pastor, go do it." It was that resounding challenge and sense of call to be a pastor that has stuck with me for over 35 years. I was both bothered by it and provoked by it. I have shared it with churches and seminary students alike. A friend sent me this quote this morning, and all I can say is amen. I get the privilege of speaking with Pastor Nominating Committees all the time but was has bothered me more than ever over the past several years is that what churches are looking for is not centered on men and women who preach the Gospel. I am saddened to say that, but it is true. I get the privilege of where I am serving at the moment, Hope Community Church, who firmly believe this. Unless churches begin to recover what Spurgeon challenges in this quote, those churches are in deep trouble. Where the Gospel of Jesus Christ is preached there will be life and vitality, where it is not there will be a slow death. The Gospel and Preaching is the most important thing a pastor does to serve and lead a congregation. Another part of the quote which is extremely relevant today is the call to go and worship and hear the Gospel preached "often". In a day and age when many Christians do not believe it is important to go to church to worship with other followers of Jesus and to hear the Word of God proclaimed with others, it is essential that God's People "go often" to church for that very reason. Charles Spurgeon remains a great prophetic voice to the church today. May his voice be heard and received. May pastors, search committees and congregations embrace the words of Spurgeon for the times in which we live. I often hear new pastors say that they are they to be "change agents," "leaders," and a host of things other than preachers. I was called to preach. It may sound old fashioned, but if I did not keep this central I would have quit a long time ago. Amen Clay...Why this is no longer the case is shocking to me. It is through preaching that we lead and feed and care for God's people which leads to transformation.